The ultimate 4G backup internet modem is one that has an integrated 4G solution where the SIM card slot is seamlessly integrated into the modem router directly itself. At the time of writing this, it is quite difficult and in fact very expensive if you are looking for a fully integrated SIM card slot 4G backup router in the market and especially one that is capable of providing failover to the NBN multi-technology network, covering off ADSL2+, VDSL and Fibre connection types. There are only a few modem routers currently in the market (as of 28/7/2018), one of bit which being Telstra Technicolor router which is used on the Telstra internet connection only, and one other router I thought to mentioned is called a Draytek Vigor 2862Lac 4G LTE Multi-WAN Router which also does ADSL / VDSL, however it comes at significant expense I’m over $800 just for the router. For the average home user this is a significant investment and one which is out of many residential home internet users reach. How a failover service works is that, when your primary hardwired Internet connection has gone down, the 4G router quickly kicks in and takes over your current internet connection. There are quite a few routers within the market that offer this functionality and also ones including plug in USB dongles, although it’s a more clunky solution compared to your fully integrated SIM card slot 4G type. 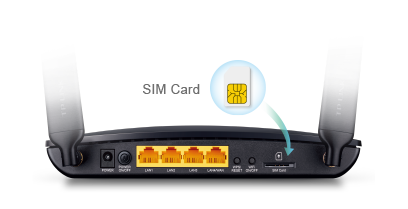 I suspect a wider range of 4G (soon to be 5G) integrated SIM card slot routers to be available for further within 2019 to 2020. The main caveat currently using the 4G as a backup solution in that is the costs involved in mobile data plan as usually they are capped to a max download limit of up to 100GB. Just now writing this 27th of July 2018 Telstra has just released a plan which is first ever in Australia using mobile data offering a whopping unlimited data for $199 per month. It's called the Telstra Ultimate, available on the 24th month plan. Up until this time unlimited mobile data has been unheard of and one which we welcome. Although the new Telstra unlimited data plan costs $199 per month and out of most average home internet users reach. It is certainly an optional solution for the homes who are struggling to obtain fast stable ADSL or NBN connections and now able to consider the Telstra unlimited mobile data plan as definite challenger option. By Telstra offering this unlimited mobile data plan it has set precedent for other ISPs to step up their game such as Optus, TPG and Vodafone to provide more competitive plans at cheaper prices at which will make a 4G backup solution for the average family home a more viable option. Just recently we’ve been chatting to TP-LINK who are one of the major suppliers for modem routers and Wi-Fi extenders throughout the world and advised towards the end quarter of 2018 they will be releasing a fully integrated TP-LINK 4G SIM card router which offers multi-wan options (ie VDSL/ADSL/Ethernet WAN) which is super exciting to see. As we head into the realms where 5G mobile data will soon be available within the Australian market next year, your 4G backup router may become redundant, and perhaps that is why we have limited 4G backup solutions currently available as we speak, because technology moves so fast, the manufacturers may be looking at waiting for releasing the full 5G mobile backup with NBN compatibility, whereas the chipset will be one that offers 5G with 4G backward compatibility. Moving forward as mobile trumps hard wired connections, I think a dual SIM card failover solution where your primary and backup internet connection is in fact running mobile data as opposed to your typical hardwired internet connection. Although there are limited 4G backup internet routers available in the market we will provide a list 4G modems and routers that you can have a look through to see suit for your needs. Should you require any further technical assistance or advice you can speak to one of Mr Telco’s technical specialist and we will provide you the information you need for selecting the best 4G backup internet connection solutions meeting your requirements. Need assistance choosing a 4G router solution?